GM Berkes made good use of his mobile queenside majority and ultimately prevaied in a sharp contest against Tran Tuan Minh. White is up a pawn in a sharp position. Now 20..Bf5 attacks the queen. How should white respond? GM Berkes ground out a subtle positional win on the black side of the Caro-Kann by seemingly doing nothing. Eventually black’s attention turned to the d4 square and eventually Berkes won this square and then the game. Black has been fighting for the d4 outpost for most of the game, which white has just secured d4 with 29.Rd3. What do you recommend for black now? 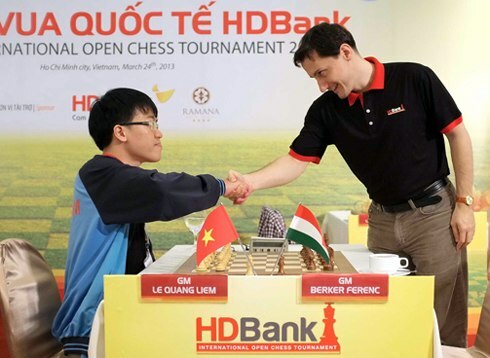 ‘Le Quang Liem of Vietnam has held Berkes Ferenc of Hungary to a draw, winning the trophy of the HDBank International Chess Championships in HCM City. With one point more than the followers, Liem entered the decisive game on March 24 with the Hungarian GM with confidence, forcing the No.2 seed to draw after 30 moves. The Vietnamese player got a total of 7.5 points after 6 wins and 3 draws, and received a cash prize worth US$10,000. In the previous two HDBank tournaments, Liem was selected No1 seed, but lost out to his Chinese rivals. 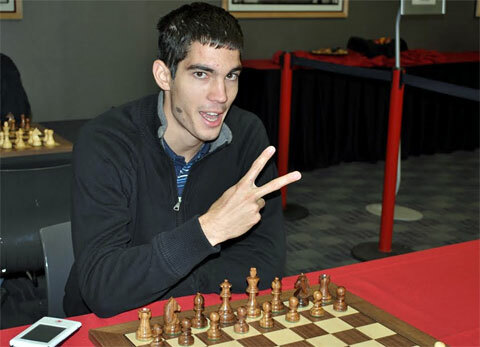 This year he delivered a brilliant performance, including a victory over Zhou Jianchao of China in round 7. Meanwhile, other Vietnamese hopefuls such as Nguyen Ngoc Truong Son, Nguyen Huynh Minh Huy, Le Tuan Minh, and Nguyen Duc Hoa were ousted from the top ten due to losses in the decisive games. GM Papp,Ga won a nice attacking game in the 3rd HD Bank Cup on the way to scoring 5.5/9. Here is the feature game. Black has been caught in the center. How should white continue?